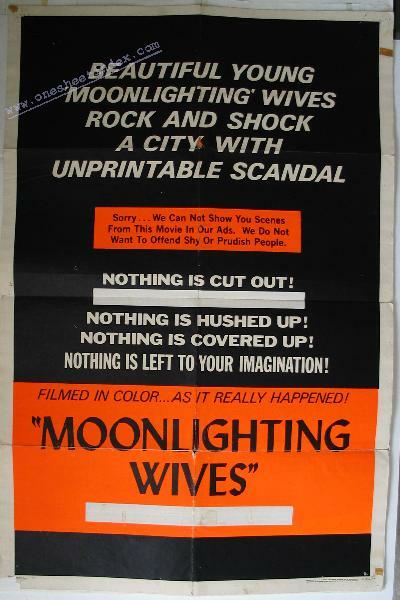 Moonlighting Wives, the 1966 Joseph W. Sarno sexploitation movie ("Beautiful young 'moonlighting' wives rock and shock a city with unprintable scandal"; "Sorry... We can not show you scenes from this movie in our ads. We do not want to offend shy or prudish people. "; "Nothing is cut! Nothing is censored! Nothing is hushed up! Nothing is covered up! Nothing is left to your imagination! "; "This is the want-ad that touched off a disgraceful morals explosion...that rocked and shocked an entire city with UNPRINTABLE SCANDAL! "; "A raw... And jarring motion picture about shameless women FILMED IN COLOR...AS IT REALLY HAPPENED! "; "'Moonlighting Wives' is not...we repeat...is NOT...for shy or prudish people!") starring John Aristedes, Victoria Jackson (credited as Tina Marie), Jan Nash, Diane Vivienne, and June Roberts.